Your mission: fix space-time and search out the 111 scientists that have been lost in the aftermath of the Universe’s greatest science experiment. Aboard your orange vessel, you must traverse the galaxy and search every wall and crevice in hopes of recovering the lost men of science. Upgrade your ship along the way as a multitude of alien creatures will stop at nothing to end your adventure throughout space. For the good of science, it’s up to you to save those lost in the galaxy. Nova-111 presents each level in a grid-like fashion in which you navigate the map but square. Up, down, left, and right are the directions you choose from. A counter ticks away with each movement that you make around the grid. Once faced with adversity, the player must rely on simply ramming their ship in to their foes to vanquish them. Each level will have a maze or puzzle the the player must get through in order to clear the level. A simple game at it’s core, Nova-111 really shines when it comes to all the added components. When first playing the Nova-111, it may seem like a mundane game that tried to bridge to worlds not often associated together; real-time and turn-base. That is because when creating something of former, it generally is difficult to include the latter. But what Nova-111 does is create a game that not only combines the two but does so in a way that is enjoyable, easy to learn, and difficult to master. Nova-111’s learning curve is set well so that players who are not familiar with either of the game types mentioned before get accustomed to it. Learning how to guide the ship is a simple task and then you learn how the environment moves and reacts. Early enemies will rely on the turn-based strategy, allowing players to avoid incoming attacks and make adjustments accordingly. On the other hand, stalactites from the roof of the cave fall in real time and forces players to respond quickly or they take damage. It is well done and the folks at Funktronic Labs ensured that the player is able to know adequately enough about each enemy and the environment around them in order to navigate the map and make it out safely. The first few stages are meant to act as an introduction and may come off boring to those that have any background in gaming. Once you discover more upgrades for your ship and the environment becomes tricky, the game becomes enjoyable. 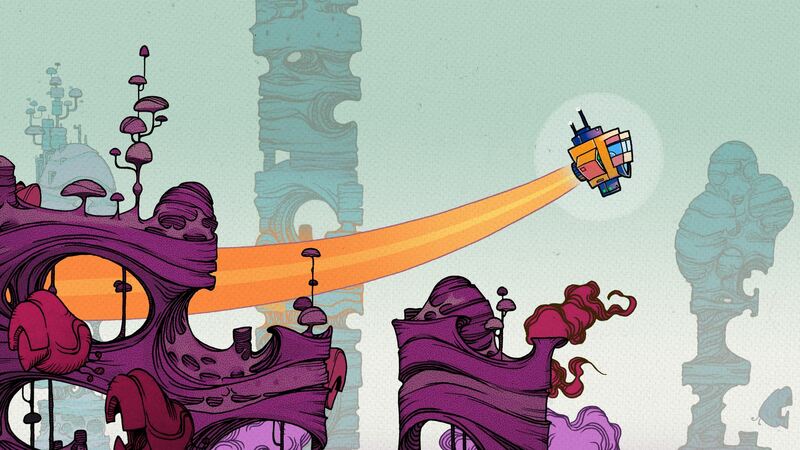 There isn’t many puzzles to solve but the game relies more on pressuring the player on making quick decisions. 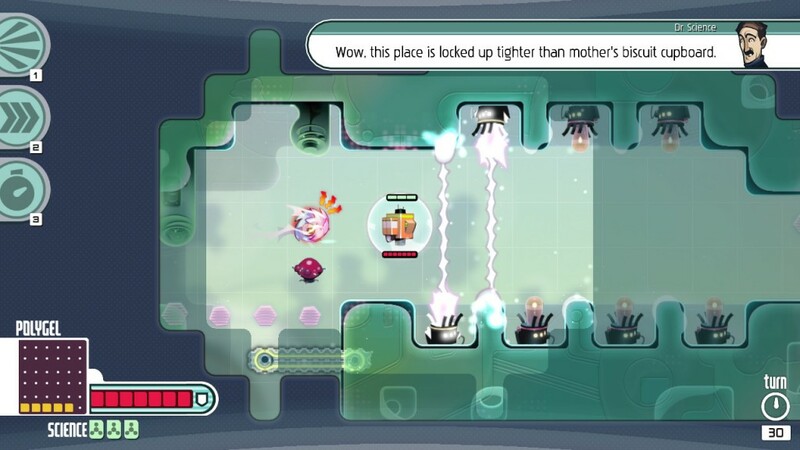 In the above screenshot, the player is forced to deal with three different things, all acting on different platforms. The enemy in front of the ship acts on a turn-based movement has the indicator that it is ready to attack. On the player’s next movement, the enemy will rush forward. The enemy below has a real-time attack that forces the player to attack it right away to avoid damage, almost forcing the player to forgo their concern regarding the other enemy. All of this happening, of course, while lasers offer a certain demise behind you. These are the things that players get to look forward to as they progress through the game. The scoring may be the only thing that gets negative marks. Once the screen comes up after passing a level, you’re given a grade reflecting how well you did during this level. One of the criteria for the grade is the amount of turns taken. 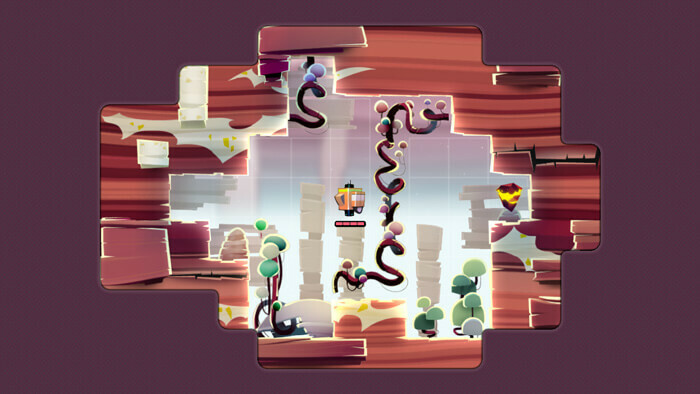 Throughout the game, you’re encouraged to explore every crevice and take the route less traveled, only to learn that you’re being penalized for wasting turns (indicated on the bottom right). It is understandable to praise players able to complete the levels in less moves, but it also forces players to avoid looking for secrets to ensure a good grade. There has not been too many instances where two very different worlds are mashed together and the outcome is something great. 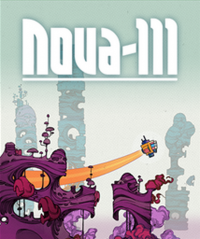 Nova-111 is wonderfully put together and thought out so that players can finally enjoy a game that mixes the two worlds. The game is thought-provoking and very challenging, but will require some good investment of time to get pass some of the later levels. Those levels can be frustrating because of the sheer madness that takes place with everything acting on different mechanisms. And if none of that attracts you, perhaps the artwork and level design will give you something to enjoy. Nova-111 dares to cross a frontier not commonly explored. Taking two great ideas and putting them together doesn’t always result in something greater. It often becomes something that you wish just stuck to one thing and you go despising this new creation. Nova-111 is none of that and is a rare gem that gamers need to get their hands on.